Granite countertop colors provide a first impression some times subtly and sometimes boldly and express a lifestyle and elegance. These furnishings are beautiful and at the same time offer functionality: usage for hot pans - heat resistant, spills - stain resistant, and much more. 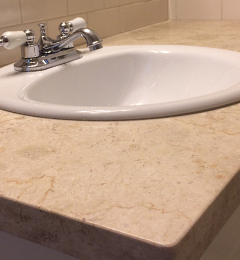 Marble is a much more elegant choice of countertops for the kitchen and bathrooms. Its natural beauty is without match due to its natural veining and look. 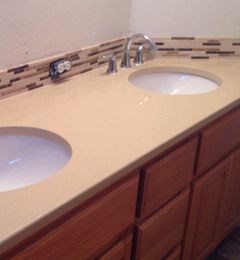 Unlike the harder granite and quartz countertop slabs, marble is porous and therefore susceptible to stains. Marble countertops need much more maintenance and care than quartz and granite. Marble had to be seal and is prone to stain and easier to scratch. 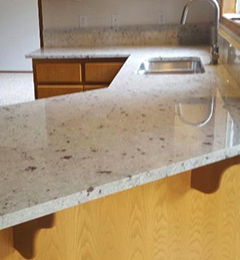 Quartz (also called engineered stone) is a non-porous surface and highly resistant to stains from coffee, wine, vinegar, etc. Because it is mand-made it is extremely dense and does not need sealing and is one of the hardest minerals making this product very durable with a high level of scratch resistance. It is also resistance to impacts and bacteria.